In October of 2009 we started collecting and repairing unneeded bicycles in Hungary to donate them to one of the poorest areas of Africa. In January 2010 we started a pilot shipping of fifteen repaired bicycles and a wheel-chair to find a new owner in Mali, West-Africa. The success of this pilot was as great and gave us motivation to carry on working. The goal was to collect more than 1000 bicycles till January 2011 from individuals and companies. Also we planned that we could make the donation traceable by taking a photo of all the bicycles with the new owners that could be sent to the donors, by doing so we could give a direct experience to them. The idea of the project was born in 2008 after we got back from a backpacker journey in West-Africa. During our travel we received a lot of help, kindness and experience from the local people so we decided to give them a small surprise. Beside the solidarity we were motivated by the aim of going back to Africa again and to get to know the African life better, to get closer to the people. The background of the project was covered by Adab Fundation formed by a community that looks for the alternative ways of travelling and sustainable transport, also it organises and promotes sample projects. From the beginning of 2010 there were numerous appearances of the project in different media. We also participated in the Bike Expo 2010 as well as the European Car Free Day in Budapest and many other thematic events and exhibitions. (Some online newsletters and presentation slideshows advertised our movement.) Our first supporter was SelfStore who supplied the place to store and repair the bicycles during the year. In addition we agreed with African Hungarian Union (AHU) and they ensured us that they will transport the bicycles to West Africa and will help us to manage the distribution with the knowledge of their humanitarian experts. Although everything was given we could only collect 78 bicycles till August. We could contact larger companies in September, therefore a big amount of second-hand bicycles was donated. Meanwhile we carried on our online campaign and our appearance on social media, which resulted rapidly increased number of donations from individuals. We had more than 400 bicycles in October. It was time to start repairing the bicycles out of order. We gathered volunteers for the reparation through mailing lists of online communities, social media and university newspapers. We could move the rider society and students successfully. Through these communities many other people joined our bicycle repairing weekends. By initiating more than 150 volunteers in our project by the end of December we repaired 298 bicycles and disassembled to parts another 86 incorrigible one. Finally our bike-o-meter, which counted the donated bikes stopped at 483. We started the transportation of the bicycles along with the Budapest-Bamako Rally 2011 as we planned. However over this point nothing went as we planned. Our professional partner (AHU) who was responsible for the transportation stood off in October. Besides managing reconstruction of the bikes we had to find a reliable shipping in the last minute and also to refuse much more donation from individuals. Finally four days before the start we agreed with a member of the rally who agreed to transport as much bicycles as we could load into his big truck for 3500€ (and 1000€ additional for customs fee). At the end the remaining bicycles were taken to Diema by Kádár Sped Ltd. audited by AHU. Our final destination was Mali in West Africa, one of the poorest countries. According to our plans the bicycles reached villages in an area where transport and water supply is needy so the donation could be an equipment for working and transport. The other goal was to give a chance and to motivate youth who live far away from school to learn. 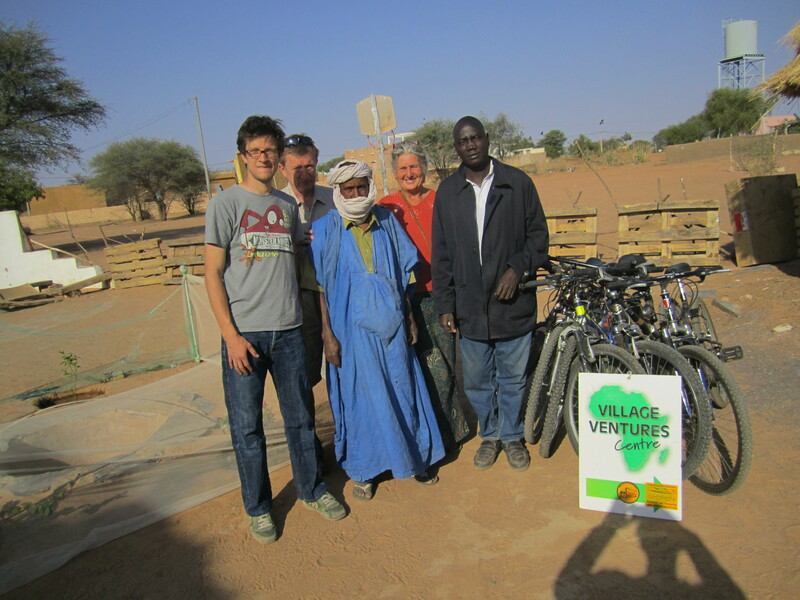 It was a significant factor in choosing destination that we found an NGO in West Mali called Village Ventures. Their center is in Diema so that is why we sent the bicycles to there and small villages surround the town. This western area of Mali is one of the worst situated place in the country because there is neither any industry nor tourism. There are missing bicycles from both trucks. According to AHU’s report the bikes were „fallen down” at police posts and frontier also we lost few at Diema. Later we met the carrier who told that AHU gave the bicycles as a gift to its interests during the way. At the end nearly 300 bicycles found a new owner in Diema and villages near the town. We have encountered corruption so we put the worse bicycles to the end of the truck thus most of missing ones is from ruins and mass given second-hand commercial bikes. Unfortunately one personal donation missed too so we could not give fair result to the ex-owner. The donation was done from 28th January 2011 by two actions. The representative of our local partner told us what are the poorest villages that we checked the situation by ourself. We gave as much bicycles to one village as much to school children, gardeners and others live there who could be developed by bicycles for longer term and use it as an equipment for keeping themselves. Out of villages we donated nomads and bushman living dispersedly. Significant number of bikes were given to school guys who won rubbish collecting competition organised between most of schools in the area. The donated bicycles affected directly about 1000 lives. We strove ensure the tenability of the project by donating parts and tools but according to our observation it could be resolved by local bike shops and garages. We took photos about all the given bicycles with its new owner and we have posted the photos to the donors since then. SelfStore – the company hires small store-rooms. They were the one of first who saw some good in our initiative. They gave a huge heated and secured hall for storing and repairing the collected bicycles. Vélo Afrique – some colleagues of Belgian Telenet started a bicycle based relief in Senegal supported by the company. They have supported us by giving 3500€ that could be used for free in the frames of the project. This donation covered the costs of non-free shipping to Diema. Telenet – the company is the Belgian subsidiary of Liberty Global Inc. also the main supporter of Vélo Afrique and through them ours too. UPC Hungary – we got in touch with Telenet through this big telco company. Also we applied and won 1000€ from them. Kádár Sped Ltd. – the carrier company helped us to transport the remaining bicycles to Mali. For the shipping they didn’t expect any compensation from us. Cseke Co. – the company is the leader of Hungarian bicycle distribution since the ‚90. In 2010 they gave 20% discount from the price of new bicycles if the buyer had transmitted his old bike. One part of collected old bicycles (302 bikes in all) were donated to the Adab Fundation. Hauser – They donated bicycle frames and handbars that couldn’t be sold because of some preoccupation with failure however they could function in proper way. In additional they gave us remaining parts form their warehouses. Gábor Katona – this young man who lives in Budapest was the only private person who gave us money to help. The donated 40 000 HUF was spent on a bicycle and lots of parts and tools. Syba Sun Protection – this company donated parts and tools for repairing ruin bicycles and its employees collected some bicycles for the project. Reciki Bicycle Garage – the two young owners of this garage in Bartók Béla Street gave us 21 bicycles. Recycle Mission – this association formed by a group of applied artists who collect and recycle in their artifact exchanged old parts from shops and garages. Now those parts are in African bicycles. Schwinn-Csepel – the experts and main repairers of this historic company helped us to guess the price of the shipment for customs. Also they gave some discount from the price of bicycle parts. Merida – we could buy parts for better price from this company. Menedékház Fundation – a colleague of this NGO helped us to repair the ruin bicycles and the NGO arranged a small bus to transport. Attila Walton – this young man collected and transported donated bicycles from the far point of Budapest with his own car. Mátrix Fundation – this NGO from Szeged helped us to collect bicycles in south Hungary. They operated a collection points at Szeged and Algyő. VeloSophie – the collection point at Pécs city was managed by this cycling related organisation. Our media partner was the Videa. In addition the employees of Kossuth Radio provided chance to be in scope time by time although there wasn’t official cooperation between the national radio station and Adab Fundation. Our professional partner was the African Hungarian Union. They hosted the collection point of Budapest city center, gave us good media contacts and helped us in customs procedure. Our onside partner was the Village Ventures who added their local knowledge and over 20 years professional experiences to the success of the 1000 bicycles for Africa project. Thank you to all our supporters, volunteers and donors for helping.